The planned test would be the first time trains have crossed the tightly sealed border in more than half a century. Inter-Korean rail links were severed in the middle of the 1950-53 Korean War, but two tracks have been reconnected as part of a series of reconciliation projects launched since the two sides held the first-ever summit of their leaders in 2000. 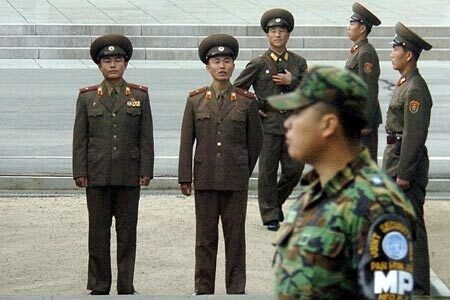 North Korea's military consented Wednesday to providing security for next week's trial run on a one-off basis, but the South was seeking to expand the agreement to cover similar future border crossings as well, according to pool reports. The two sides late Thursday were still trying to work out the wording of a joint statement to be issued at the end of three-day talks at the truce village of Panmunjom inside the Demilitarized Zone, according to South Korea's Defense Ministry. Economic officials from both sides agreed last month to conduct the train run May 17, but North Korea's military has the final say on whether it goes forward because such a border crossing requires security arrangements. South Korea hopes the inter-Korean railways could ultimately be linked to Russia's Trans-Siberian railroad and allow an overland route connecting the peninsula to Europe significantly cutting delivery times for freight that now requires sea transport. Last year, the two sides agreed on a similar rail test, but North Korea called it off at the last minute because the North's military raised objections after the South rejected its demand that their disputed western sea border be redrawn. The North's delegation raised the sea border issue at this week's talks, but appears not to have made it a condition to agree on security arrangements for the rail test. But the North's navy command warned that a skirmish near the maritime border the scene of deadly clashes in 1999 and 2002 could occur at any time unless Seoul stops entering the North's waters. South Korea's alleged border violation is "a premeditated military provocation" designed to escalate tensions, the North's navy command said in a statement carried by the North's official Korean Central News Agency. North Korea doesn't recognize the current sea border demarcated by the United Nations at the end of the 1950-53 Korean War, and has long claimed it should be further south. The waters around the border are rich fishing grounds, and boats from the two Koreas often jostle for position during the May-June crab-catching season. This week's talks that include two-star generals are the first high-level military contacts between the two sides in a year. The two Koreas remain technically at war because the Korean War ended in a cease-fire that has never been replaced with a peace treaty. Ties between the two sides have warmed significantly since the 2000 summit, although they suffered during the international standoff over North Korea's nuclear ambitions. Pyongyang conducted its first-ever nuclear test in October, chilling relations with the South. But the South began embracing the North again after Pyongyang agreed in February to shut down its nuclear reactor under an agreement with the United States and four other neighbors. Still, the communist regime missed an April deadline to close the reactor because of a separate financial dispute with the United States and it is unclear when it will do so.